I’ve asked many of the artists I’ve had the privilege of interviewing who they would love to work with. Many times, these phenomenal artists will mention someone who has passed away. In what stands as one of the boldest, most ambitious projects of his storied career, Waterboys auteur Mike Scott has collaborated, figuratively speaking, with the legendary Irish poet W.B. Yeats on the 14 songs of An Appointment With Mr. Yeats, on Proper American. “I love the way Yeats’ poems lend themselves to music,” says Scott. “But I also like Yeats as a guy — a dandified, opinionated, larger-than-life character. I feel a kinship to him. My purpose isn’t to treat Yeats as a museum piece, but to connect with the soul of the poems — as they appear to me — then go wherever the music in my head suggests, and that means some surprising places.” Scott will bring the Waterboys to New York’s Town Hall in March for the American premiere of this provocative song cycle uniting a pair of artists separated by a century. While the notion of mounting classic poems in modern musical settings may strike some as challengingly esoteric, that is not the case at all with An Appointment With Mr. Yeats. On the contrary, the new album connects with the power and immediacy of Waterboys classics like This Is the Sea (1985) and Fisherman’s Blues (1988), unfolding with the widescreen vividness that has characterized Scott’s single-minded body of work during the course of the last three decades. This captivating oeuvre has come to be known as “The Big Music” after the early Waterboys song of the same name. 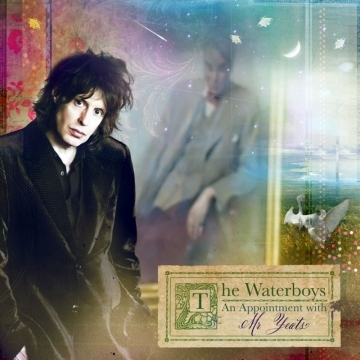 At the same time, this wildly imaginative work heralds yet another musical metamorphosis in the ever-mutable world of the Waterboys. An Appointment With Mr. Yeats was produced by Scott and Marc Arciero and tracked live off the floor by an expanded Waterboys lineup consisting of fiddle maestro Steve Wickham, Katie Kim (vocals), James Hallawell (keyboards), Kate St John (sax, oboe), Blaise Margail (trombone), Ralph Salmins (drums), Sarah Allen (flute) and Joe Chester (guitar). Before they recorded the album, Scott and his band premiered the songs at Dublin’s hallowed Abbey Theatre during a five-night run in March 2010. “A stunning reinvention of Yeats’ poetry,” The Irish Times raved. And that is precisely what Mike Scott and the Waterboys have done on this rhapsodic and revelatory labor of love.